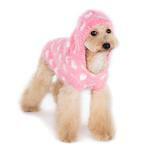 Cuddle up with the one your love in this PuppyPAWer Heart Hoodie Dog Sweater by Dogo in Pink! Make your Valentine and spring cozy with the PuppyPAWer Heart Hoodie Dog Sweater by Dogo! 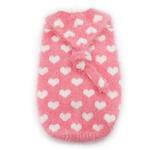 Fuzzy hooded sweater in pink is covered in white hearts. A designer knot on the hood. Ribbed trim with a high cut belly. Made of feathered yarn. Great for Valentine's day and everyday filled with love! Posted On 01/31/19 by Korena S from King City, OR Yes, Korena S recommends this product! Perfect for Valentines Day. Sweater is soft and fits my girl so well. The detail on the hood is adorable too!!! Adorable for my tiny baby, well made and warm. Posted On 04/09/17 by Miss Bella the Pomchi from Saratoga Springs, NY Yes, Miss Bella the Pomchi recommends this product! This Dogo fuzzy sweater is very good quality, looks exactly like in the picture. There is also a discreet leash hole in the back. We ordered L for our 14lbs Pomeranian/ Chihuahua pup and it fits her nicely (not a very loose or a snug fit). Bella recommends this sweater!